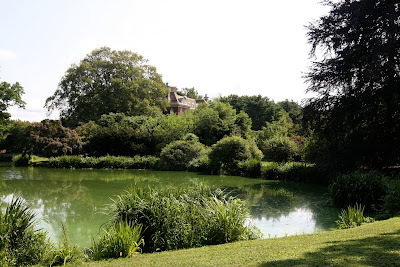 The West Pond and a small glimpse of 'Westbury House' at Old Westbury Gardens, the John Phipps estate designed by George Crawley c. 1905 in Old Westbury. Click HERE for more on 'Westbury House'. Zach - To me, THIS is a real country house. Both the gardens and House are lovely and the interiors are also beautifully done. Do they not allow photos of the interiors? Another wonderful house rarely shown is the Fay Ingalls house, Sunken Orchard - any pics of that? I must have seen this when you posted it before but forgot. Thanks for the quick response. And - wow that house is beautiful although the interiors are darker than I thought they would be. It is quite an extensive estate. I didn't realize the Woodwards only had the playhouse. I thought they had the whole thing and just let the playhouse was given over to their son & his wife, until..